::Set the timer for 15 minutes and go through your dresser drawers. Remove items you no longer love, need, and/or wear. Quickly organize the remaining items. ::Wipe down all the door handles in your home. You can use a damp rag with a little disinfectant on it or a cleaning wipe. If you have younger children, they’d probably enjoy joining you in tackling this project! Yes, this needs to be done and while I am near every door I think the switchplates need doing too! Thanks for the nudge! Whew, much more doable task today!!! Still working on the baseboards from yesterday! Agreed! I would definitely consider this an easy task, especially since we do it quite regularly (along with the switchplates). Finishing the baseboards is on my list today, too! One great tip I saw recenty somewhere on a blog was to keep a trashcan lined with a trash bag in your closet. Anytime you come across something in the closet or dresser that needs to go just toss it in there. When the bag gets full take it out and donate it. I plan to do this so we can keep ahead of the overstuffed closet problem. I haven’t had time to join in, but you have inspired me today with things I need to do! I decided to take the plunge to get rid of seven things. This led to me selling some kids’ clothing on a local Facebook page. I live in a rural area but was able to set up delivery for when I went to town. In two trips to town I was able to sell $98 worth of stuff thanks to your suggestion. My girls and I have decided to start a vacation fund with anything we sell of their clothes or toys. We are all very excited. Thank you for your encouragement along the way. Yay, this seems easy! I mentioned on last night’s update, would you consider putting together a printable checklist of all our tasks when we’re done? I’d love to have one! Thanks for helping me get my house together! I’d love a checklist, too. I don’t have time right now to keep up with the tasks, but I want to tackle them this summer. Yay! I’ve already gone through our drawers and gotten rid of everything we can, which is partially why I started the challenge with six bags of things for Goodwill in our van. 🙂 The doorknobs won’t take long to do at all, especially not with my chidren helping. This will give me a chance to finish catching up on my other assignments. Here’s to another productive day! I’m doing the 2012 things in 2012 challenge. I find at least 10 items per day on weekdays to toss, donate or recycle (or Freecycle). I’m not following on your assignments, but I am tackling one area each day to clean that badly needs it. Yesterday, I went to get my air popper out for making popcorn for our afternoon snack. The plug was stuck. I keep the popper in the cabinet above my stove. The plug was stuck down the vent shaft. So I got on the stepstool and released the plug but saw that the bottom of the cabinet was all sticky and yucky. Standing on the floor I can’t see the surface of the cabinet and my husband doesn’t look up there because he doesn’t eat popcorn! So, I washed that cabinet before I made the popcorn. Hooray! I can do this! And hopefully have some time to finish those evil baseboards! A nice easy one! And a commonly overlooked one! Glad I’m getting this done… hopefully it’ll keep my family healthier… I plan on adding light switches, cabinet pulls, toilet handle and other commonly touched things. It’ll be a disinfecting day. Good idea with the light switches! Thank you for this. I just finished my baseboards and they were SO dusty. I’m not sure I’d cleaned them since we moved in almost 2 years ago. 🙁 But they look better now! Washing baseboards and doors are much easier tasks for small apartment dwellers than selecting 7 items has been! I don’t have that much space to stuff extra things to easily find 7*20 extra items. Tempting! I feel like I’m taking a bag of papers down every week to be recycled and it’s just the two of us so I never understand how it piles up so fast. Ha! I was thinking the same thing and wondering if I was doing something wrong. 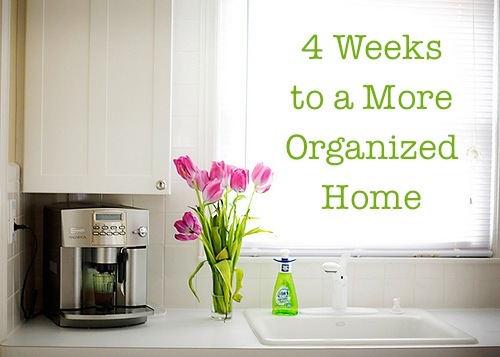 No garage, no attic, no basement, and barely and closet space…so where do I come up with 7 items a day? This has been a really fun challenge. I completely surprised myself yesterday when I went thru my closet and found tons of stuff to donate! Exactly! The “clean under items” was also an interesting challenge since I utilize the under bed and under cabinet space for additional storage. I confess I pushed my fiance to go through his drawers last year but only did a token effort on mine. I really ought to clean out my closet too because I *know* there are items in there I haven’t worn in one year. This I can handle! My dresser drawers are pretty empty right now because I haven’t brought my summer clothes down from the attic yet. I only did one baseboard yesterday. I used a damp cloth, and the baseboard was so dirty that the dust mixed with the water on the cloth and got streaks of dirt of my wall, so I had to clean my wall. ***sigh*** I’m such a great housekeeper……not! We do this regularly so I know I can get the kids to help me. I forgot yesterday to find 7 things to get rid of but the junk drawer need to be gone through so I am sure I will find somethings there. Thanks for the new series. I enjoy coming on each day to see what you have in store. Sometimes you just need that extra reminder of jobs you don’t do in your normal day to day cleaning. Our house is starting to look less cluttered and cleaner. I love the 7 things to get rid of/donate. I am sure I have had a few days where I have gotten rid of 10 or more things. I go for hunts to find things….its actually fun. lol Off to clean door knobs! : ) Thanks! I am love love lovin’ this series but because I work part time out side the home I am behind a few days- any chance you can make a printable of all the tasks at some point in the 4 weeks? thanks!!! And, luckily, I wipe down all the door handles on a daily basis, so we’re set there. I too would love a list of all teh “bold” tasks as I hope to do them all this summer when I am not teaching. I love your way of posting the assignment and then the results too! I also want to try to do the 7 things a day but with my children. I want to see if they will be willing to part with things too if I make it a challenge to seeif they can collect the items faster than I can! I think we will do 10 items each on Saturdays…40 items a week from my house would really help improve the amount of clutter! Could u kindly send me the links to assignment #2 and #1 . I could not find the link to the same. You know at first I dreaded the 7 things, but now it is the first thing I do to get me motivated! I totally agree! I was nervous about coming up with 7 things everyday, but it is so refreshing to know that you are taking a little more clutter out of your life! I feel like that is the permanent part! The dust may recollect, but that piece of clutter is GONE!!! This has motivated me so much!! I look forward to reading the new post every morning and how you did every night. I also Love reading everyone’s comments on how they did or what they did different. This is a blog that I wish was year round because it keeps me focused. One thing extra I did this week was went through my entire closet and since I have recented lost over 25lbs, I pulled all clothes out and separated what fit and what didn’t fit. I am donating or consigning depending on how nice the clothing is. I Love my closet again. Seriously, it is really odd how fun this has been. I’m still not done with the baseboards (I’m 6 months pregnant plus i keep getting distracted by the fingerprints and smudges all over my walls!) but breaking all these tasks up into bite sized pieces and getting to work on them “together” is so motivating! (The nesting instinct helps, too!) I’m going to vacuum the couches out tomorrow when I do our main living areas and our bedroom is already spotless since we just painted it, so that is helping me feel more caught up on all this. 🙂 Just have the baseboards in the kids’ bedrooms left to do! I agree – It really has been actually FUN. How weird! LOL! I am 5 months along and I want to get all this done before this babe comes. The doorknobs, light switches, & telephone are also good to do frequently throughout cold & flu season (to prevent spreading germs). As a prior school nurse, I’ taught infection control for years & many people don’t realize this. Okay, I am a bit behind but I my vacuumed out my couch yesterday, and I just finished wiping down my fridge. We got sick over the week end and my DH stayed home for the past day or so. Now, to get to those dresser drawers and door knobs. I really enjoy reading the posts that people write. It makes me feel like I am not alone in this adventure. Thanks for this…. it really needed doing 🙂 I was also using today to try the “get rid of 7 items”….I thought it would be hard. It wasn’t and I found other items I could get rid of too. I donated 3 pairs of old eyeglasses, one case to go with them, and I got rid of an old warranty booklet for an item I no longer have. I got rid of a pile of papers/brochures/ driving directions from our recent trip from Florida. (just got home Monday)…it feels good to know I won’t be looking at them forever! Thanks again for the motivation. I also like the idea from the other day about the long handled duster to reach behind furniture for the baseboards!